Art by Jim Valentino. 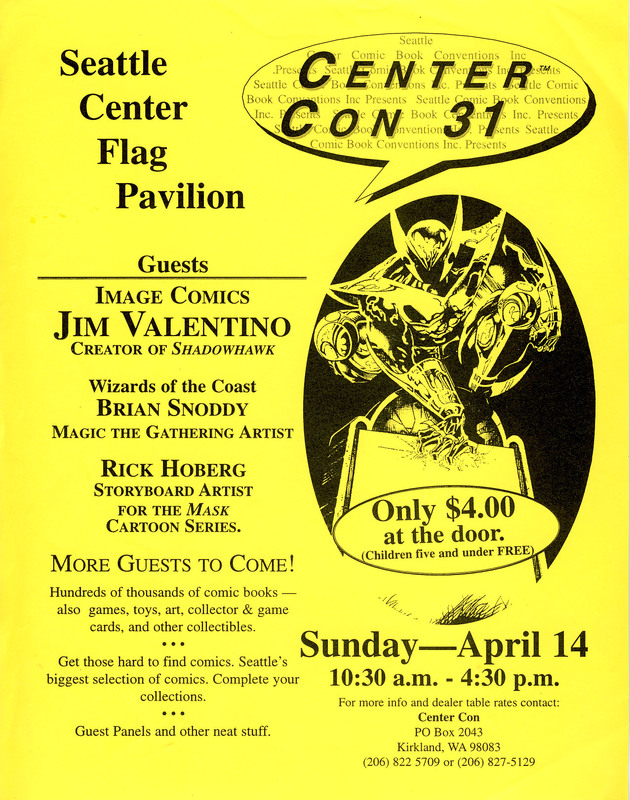 With this show, Center Con was now a corporation! 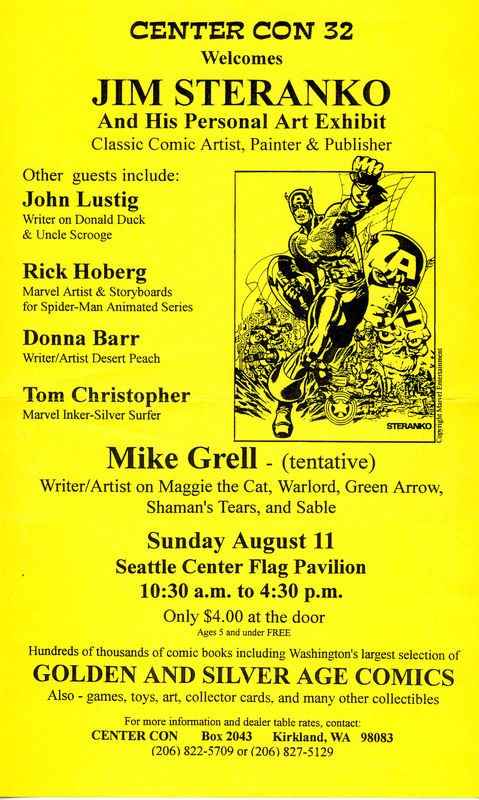 Based on the long form of our name Seattle Center Comic Convention, we incorporated under the name "Seattle Comic Book Conventions, Inc". 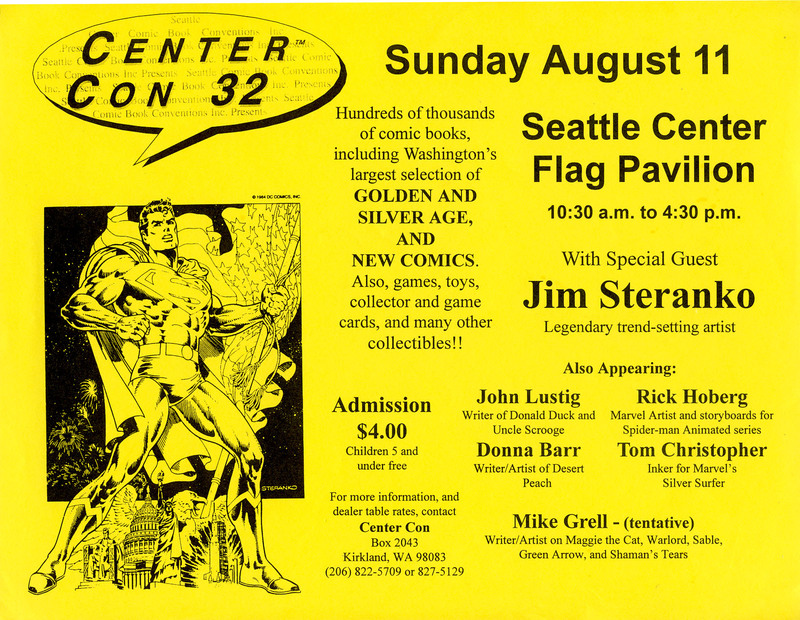 We dropped 'Center' from the corporation name, due to the problems scheduling with the Seattle Center, and thinking we may have to move somewhere else. Joe McGuire became a partner with Bill and Carl, and Eric Burris (of the highly successful Bellingham ComicCon) came on to help with the workload. A local comic distributorship had been nice enough to help us distribute our flyers in the years previous to this. With this show, for some unknown reason, even though we turned in the flyers to them 5 weeks before the show, they did not send them out until 10 days before the show. We did not find this out until the day of the show, and our attendance dropped considerably, with many unhappy dealers. Consequently, we took back our own distribution from this point on. Art by Jim Steranko. Our attendance came up a bit from our previous show, but still was low. We decided to take a year off to consider our options, and during that year, decided that it just wasn't worth continuing on. And we all had other things going on in our lives to deal with.